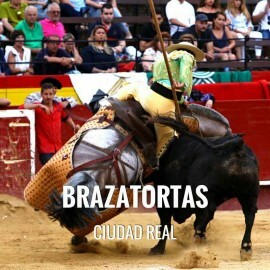 Bullfight tickets to Brazatortas, all bullfights organized in the Bullring of Brazatortas. Fiestas Patronales en honor al Cristo de Orense 2019. Fast and secure online ordering. Immediate information of all the Bullfighting Festivals. A virtual store with the most powerful technology and design of the sector. Easy navigation, transactions with high security and confidentiality of data. Brazatortas is located 60 km from Ciudad Real (45 mins by car). How to get from Ciudad real to Brazatortas. Fiestas Patronales en honor al Cristo de Orense : Still needs to be confirmed. Servitoro, Official Box office of bullfighting tickets sales at Brazatortas, Ciudad Real bullring.